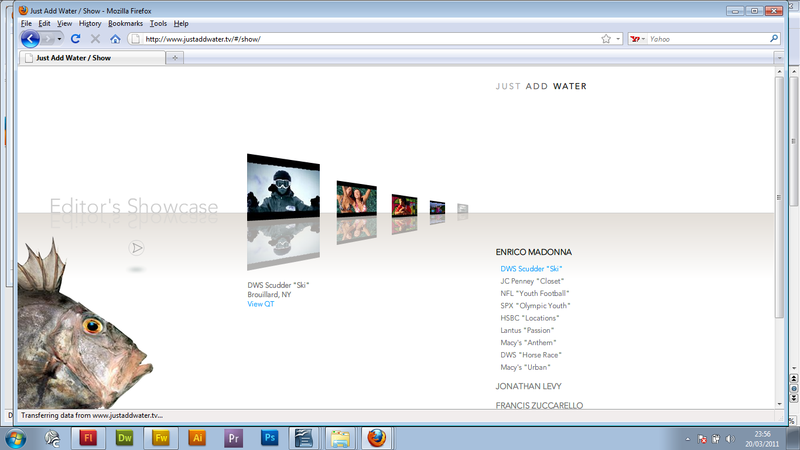 This is an example of a site called “just add water” that has a lot of fancy animation that relies on flash. A lot of fancy animation is used in this site and appears randomly in all directions, although this website may appear to look good I think that it was a bad choice to use flash so much in this web site. The reason is that the animations are distracting, you start reading some of the important text information and another animation appears on the screen taking emphasis off the information because you cannot help but look at the animation. The navigation on this page is also animated and keeps changing position to make it appear to look like waves to go with the “theme” of the site. I think this is very distracting also. Because of the amount of flash that has been used in this website it takes several minutes to load, there was an option to skip the intro but that option did not appear for about 30 seconds. If I was visiting this site to find information and did not need to get a screen shot of this website then I would not have bothered to wait for the page to load I would have gone elsewhere. I think that this website looks good in general but it is so difficult and annoying to use in most parts that the effort of the designer has been lost. Too much emphasis has been made trying to make this site look cool that it fails in all other areas. I think that if flash is used in a website it should help communicate something to the audience and address their needs, not just be there to look good. If flash annoys the user , as it has in this instance, and gets in the way of addressing audience needs it is simply better not to use it, however subtle animations that help to enhance the user experience can be a good thing and flash can be an excellent tool to use for this reason. Another thing to consider when using flash is how many end users will have the plug-in. The 15% of users that dont have the flash plug-in or have an outdated version. A lot of sites that use flash have the option to download it, but how many of those will bother to download it. If you overuse flash in your website and do not use enough text you may put yourself at a disadvantage with your exposure to search engines as they wont have the information to index your site. If want your site to be accessed through search engines, overusing flash may be a bad idea. This is an example of another site that uses flash but in this example the choice of using flash for this website enhances the user experience this is because unlike the bad example the flash animation that is used in this website is relevant to what the site is about and helps communicate to the user. 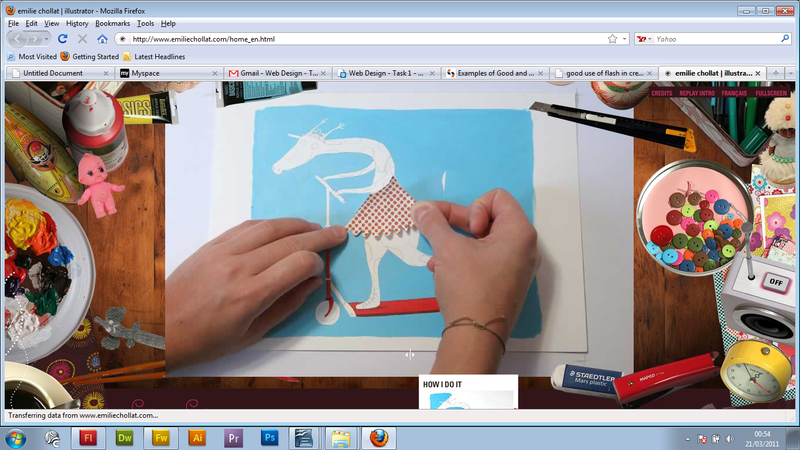 The flash animation that appears when loading this web page is interesting and keeps the user fixed to the screen. The animation on this site does not distract the user because it only plays when the mouse hovers over the animation, when it does not, the animation and the music stops so the user gets to choose if they want it to play or not. I think that the choice to use flash in this website was a good one because although it takes up the majority of the page it has not been overused and is controlled by the user unlike the bad example which plays whether the user want to see it or not.